Moving data between commands? Use a pipe to make the process quick and easy. In Linux, the pipe command lets you sends the output of one command to another. Piping, as the term suggests, can redirect the standard output, input, or error of one process to another for further processing. Here, the pipe cannot be accessed via another session; it is created temporarily to accommodate the execution of Command-1 and redirect the standard output. It is deleted after successful execution. In the example above, contents.txt contains a list of all files in a particular directory—specifically, the output of the ls -al command. We first grep the filenames with the "file" keyword from contents.txt by piping (as shown), so the output of the cat command is provided as the input for the grep command. Next, we add piping to execute the awk command, which displays the 9th column from the filtered output from the grep command. We can also count the number of rows in contents.txt using the wc -l command. This creates a named pipe file that can be used even over multiple shell sessions. To redirect a standard output of any command to another process, use the > symbol. To redirect a standard input of any command, use the < symbol. As shown above, the output of the ls -al command is redirected to contents.txt and inserted in the file. Similarly, the input for the tail command is provided as contents.txt via the < symbol. Here, we have created a named pipe, my-named-pipe, and redirected the output of the ls -al command into the named pipe. We can the open a new shell session and cat the contents of the named pipe, which shows the output of the ls -al command, as previously supplied. Notice the size of the named pipe is zero and it has a designation of "p". 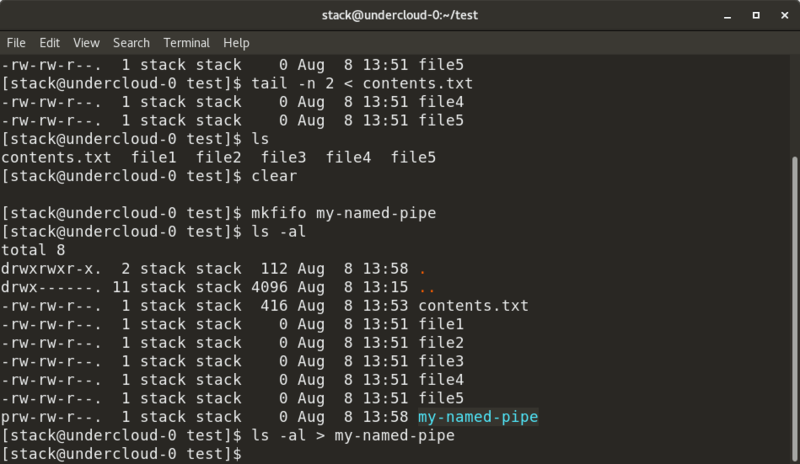 So, next time you're working with commands at the Linux terminal and find yourself moving data between commands, hopefully a pipe will make the process quick and easy. Archit Modi - OpenStack enthusiast. Linux and Networking guy. Currently working as a Software Test Engineer at Red Hat, involved in Nova project- OpenStack. Just trying to give my two cents in this billion-trillion dollar "Open Source" world.